In order to bring computerized pointing to your Celestron Celestar 8*, you will need to fit a pair of devices known as optical encoders to each axis of your mount. Part number pn-c8p-bspec is a specially priced bundled solution that provides an Argo Navis™ Digital Telescope Computer, the optical encoders and all the necessary mounting hardware specific to your Celestron Celestar 8* Fork along with the encoder cable that is used to connect between each of the optical encoders and the Argo Navis™ Digital Telescope Computer itself. Encoder mount hardware designed specifically for the Celestron Celestar 8* 8" Schmidt-Cassegrain Fork mount. RA axis resolution : 10000 steps effective. Dec axis resolution : 10000 steps effective. 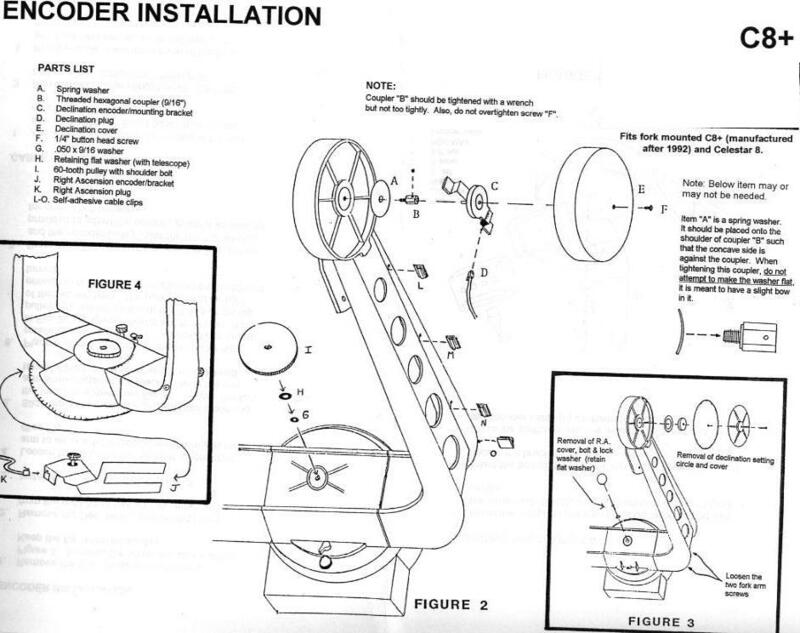 Click here for a scanned image of the installation diagram. Please note that most mount kits are built on demand once we receive your order. Sometimes we have kits in stock, otherwise a typical lead-time is 1 to 6 weeks from order. Please email us at sales@wildcard-innovations.com.au for a lead-time estimate on this kit. Verify that fork is non-tapered. Please email us at sales@wildcard-innovations.com.au with this information or to seek additional advice.